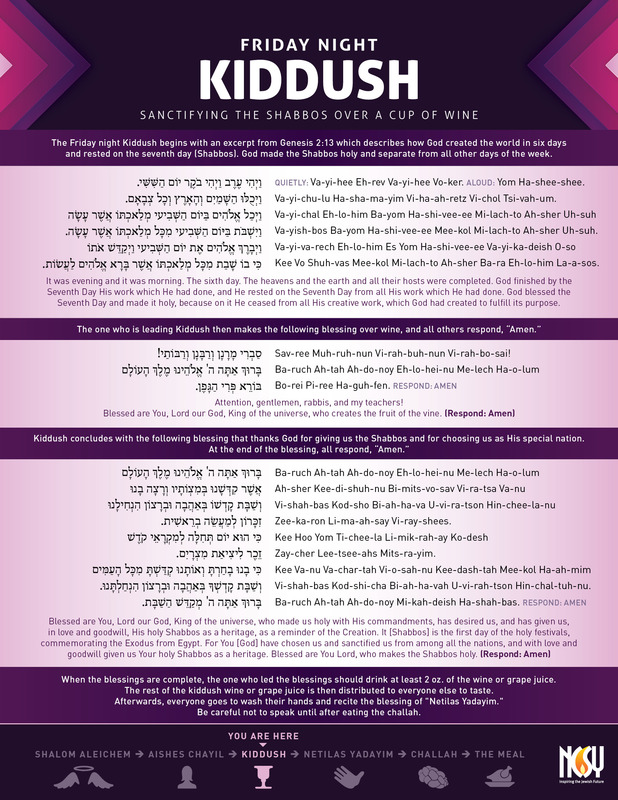 Print this page for your Shabbos guests to follow along during Kiddush on Friday night. Includes the Hebrew text of Kiddush with English translation and transliteration. If you need this page in a different format, please email Rachel First at firstr@ncsy.org. The Friday night Kiddush begins with an excerpt from Genesis 2:13 which describes how God created the world in six days and rested on the seventh day (Shabbos). God made the Shabbos holy and separate from all other days of the week. (Quietly:) Va-yi-hee Erev Va-yi-hee Voker. Va-yi-chu-lu Ha-sha-ma-yim Vi-ha-ah-retz Vi-chawl Tsi-vah-um. Va-yish-bos Ba-yom Ha-shi-vee-ee Mee-kawl Mi-lach-to Ah-sher Ah-sah. Kee Vo Shah-vas Mee-kawl Mi-lach-to Ah-sher Ba-ra Eh-lo-him La-a-sos. It was evening and it was morning. The sixth day. The heavens and the earth and all their hosts were completed. God finished by the Seventh Day His work which He had done, and He rested on the Seventh Day from all His work which He had done. God blessed the Seventh Day and made it holy, because on it He ceased from all His creative work, which God had created to fulfill its purpose. Attention, gentlemen, rabbis, and my teachers! Vi-shah-bas Kawd-shi-cha Bi-ah-ha-vah U-vi-rah-tson Hin-chal-ta-nu. Ba-ruch Ah-tah Ah-do-noy Mi-kah-deish Ha-shah-bas. When the blessings are complete, the one who led the blessings should drink at least 2 oz. of the wine or grape juice. The rest of the kiddush wine or grape juice is then distributed to everyone else to taste. Afterwards, everyone goes to wash their hands and recite the blessing of Netilas Yadayim. Be careful not to speak until after eating the challah.